home - faqs - how do aeds work? When someone goes into sudden cardiac arrest, their heart muscle stops beating in a regular rhythm and cannot pump blood and oxygen through the heart or to the rest of the body. An AED analyses the electrical activity of the victim’s heart and checks the heart’s rhythm. If the heart is in ventricular fibrillation (VF) or ventricular tachycardia (VT), the AED instructs the provider to press a button that delivers a controlled shock to the victim’s heart. If the person is not in VF or VT the AED will not allow a shock to be delivered. 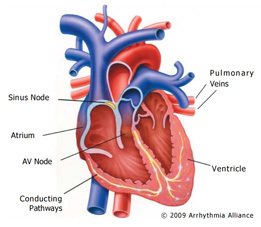 Defibrillators work by delivering electrical energy to the heart during a cardiac arrest to correct the rhythm. The shock stops the heart briefly by depolarizing the heart muscle and allows the heart to resume a regular rhythm. Placing the electrode pads in the correct position ensures that the electrical energy from the defibrillator follows the correct pathway through the heart. This pathway runs from the top right-hand side of the myocardium, down through the centre of the heart to the left-hand side of the ventricles.